Jacob Truedson Demitz (born Lars-Erik Jacob Ridderstedt on August 13, 1948) is a Swedish-American writer and entertainment director who wrote a 1996 book about Scandinavian kings and, as Lars Jacob, has directed underground cabaret shows in the United States and Europe since 1972. He was born in Sweden, grew up in Illinois, and has since lived in Sweden, Florida and California. Demitz was born in Örebro, Sweden, the son of singer Birgit Ridderstedt and C. Erik Ridderstedt, and first arrived in the United States as an infant. He lived in and near Chicago until the age of 13; his father headed a crafts and gifts import business and his mother produced entertainment ventures. Not wanting to be mistaken for a cleric uncle also called Lars Ridderstedt, who had gained notoriety in Sweden, he decided in 1969 to use Jacob as his first name. In 1980, after noticing for many years that Americans had difficulty pronouncing his parents' last name, he adopted the surname of Demitz, which had been the original name since 1693 of the extinct House of Ridderstedt before they were ennobled. He was the first in 300 years to revert to that name. His patronymic Truedson, which he added in 1990, stems from a Scanian great-great-grandfather, Trued Abrehamsson, whose lineage has been traced back to the 1640s when the area and the family were Danish, and whose descendants live in many parts of the US. In 1996, after more than 30 years of research, Demitz published Throne of a Thousand Years, an account of the rulers of Sweden that has been appreciated particularly for its English-language name forms for Swedish royalty and lack of nationalism. The book has been acquired as a reference work by many libraries, including the national libraries of 73 countries. It has been out of print since 2001. Demitz's 500-volume historical library has been accepted in advance for posthumous donation to the Folke Bernadotte Memorial Library at Gustavus Adolphus College, making him a member, as of 2005, of the college's Gustavus Heritage Partnership, named for King Gustav II Adolf of Sweden. An STIM member since 1970, Demitz has scripted and directed Max von Sydow for television in English and written special lyrics for major corporations. In 1996–1997 he wrote a regular half-page editorial column for Nya Ludvika Tidning and has written many other press articles and for information websites like Find A Grave. Demitz's published song lyrics started with a record album for EMI in 1970 that had good reviews, and a single for Odeon the following year, both of which included his Swedish version of Burt Bacharach's "Close to You". Other adaptations include "Santa Baby", "Swing Low, Sweet Chariot" (both in Swedish), and an original company song in English for SAS Group called "Flying Time". He also has written as a human rights activist, and his complaints led to the censure of one of the Sweden's top judges in 1993, over erased trial tapes of testimony, and in 1995 to a nationally publicized debate over the use of young children to sell lottery tickets, commented on by a Cultural Minister in agreement. In later years, Demitz has reviewed and rewritten English text for Swedish individuals and organizations, including Karolinska Institutet in 2005. From 2013 to 2014 CabarEng published recordings featuring over 50 of his song lyrics (also in 2015 a list of them) in Swedish, as well as special underground cabaret lyrics in English, mainly with Yaiya Sacasios and other young members of the group, and in a few cases more established personalities like Kjerstin Dellert, Kim Anderzon, Gunvor Pontén and Christer Lindarw. He has worked as a lyricist with composers such as Ian Whitcomb, John Groves, Berndt Egerbladh and Harald Lindell, and has collaborated occasionally with Örjan Ramberg and other co-writers on the lyrics. Demitz debuted as a solo singer at the age of nine in one of his mother's programs on WTTW, was active in music and drama in school and began mainstream stage performances in a short-lived Swedish musical in 1968. Demitz graduated (Studentexamen) from Mörby Läroverk, a junior college in Danderyd, Sweden, specializing in languages and the musical arts. Less than two years later, he moved to Florida, where he attracted interest as a model of free-spirited European youth. In 1972 he was a featured guest on the talk shows of Herb Hunt and George Michelle. As Lars Jacob, Demitz was a Stockholm and Gothenburg disc jockey and dance leader in the early 1970s, and choreographed disco scenes in an avant-garde motion picture, More from the Language of Love. 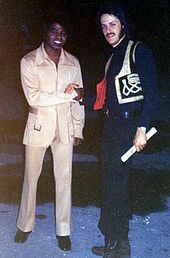 Returning to Sweden from Florida, he soon was Director of Entertainment for nightclub queen Alexandra Charles and in 1975–1976 put on shows for her in Stockholm and in Gothenburg that he had created earlier in Miami Beach. Fans of his cabarets included the members of ABBA and tennis champion Björn Borg, who saw rambunctious new ground broken in domestic Swedish entertainment. His position at Charles's famous club gave him the opportunity to have a long-lasting effect on some genres in Swedish entertainment. Lars Jacob’s spoof Wild Side Story had more than 500 performances in 1973–2004 in Florida, Sweden, California and Spain. Demitz hosted a formal celebrity dinner at Berns on the Mae West Centennial in 1993, but his planned show extravaganza there a month later was cancelled because of new demands from the restaurant due to insufficient sales of the SEK 1,000 tickets. That same year and in 1995 he did some of his most appreciated performances as the "Preacher" in an outdoor musical event called Farmer's Wedding (by August Söderman) performed in his mother's native town of Ludvika and at the Stockholm Water Festival in the royal Kungsträdgården park. The F.U.S.I.A. cabaret school (1998–2005), which Demitz co-founded with Agnes Källström and where he was creative director, received a Skandia "Ideas for Life" grant in 2001 for a youth project called Läckerhetsvakten (a pun on 'security guard' for youthful health and attraction), awarded by Alice Bah, as of 2014 Swedish Minister of Culture and Democracy. He has also lived in Salzburg, Austria, where in 1968–1969 he studied voice with Grete Menzel, has English and Swedish as primary languages and speaks fluent German, French and Spanish plus dialects and phrases of a number of other tongues. Being multilingual, and his entertainment background, worked for Demitz in 1999–2000 at the 5-star Palm Oasis resort (belonging to Interval International) on Grand Canary, where he became a successful timeshare agent and defended ethical practices in that field. He was mentioned negatively in severe criticism of timeshare by the Swedish newspaper Expressen. Since 2005 he has been Chairman of the nonprofit foundation Southerly Clubs and since 2006 Deputy Chairman of FamSAC, an international society of some 5,000 relatives, among them Stanley M. Truhlsen, Mattias Klum, Erland Brand and Siri von Reis. Demitz has arranged and hosted international family reunions and commemorations in the Swedish capital and provinces of Sudermania, Scania and Dalecarlia as well as in New York City, New Jersey, Michigan, Minnesota, Nebraska and Wyoming. For the CabarEng ensemble and its producer Emil Eikner, from 2009 until his retirement in 2013, Lars Jacob directed Tuesday night cabarets such as CaCa Bleu and ÄngelCab (2013) in Stockholm. He went on tour in 2011 with the group doing A Tribute Westward and Cabaret Large A-Cup at venues in Manhattan, Washington DC, Annapolis and Boston. In retirement he is still consulted by cabaret groups and occasionally writes or lectures as a freelance inter-cultural communicator. Lars Jacob's ensembles, recording projects and cabaret orchestras have included Logan Carter (stage debut 1972), Thomas Dellert Dellacroix (stage debut 1975), Anders Eljas (debut as band leader 1975), Steve Vigil (stage debut 1975), Christer Lindarw (stage debut 1976), Ulla Jones, Graham Tainton, Christina Schollin, Berndt Egerbladh, Camilla Henemark, Johanna Lind (TV debut 1993), Chesty Morgan (band), Max von Sydow, Jimmie Kersmo (stage debut 1998), Helena Mattsson, Mohombi Moupondo (stage debut 2002), Yaiya Sacasios, Kim Anderzon, Gunvor Pontén, Hans E. Wallman and Kjerstin Dellert. He lived with Vigil from 1974 to 1982. Formally, Jacob Truedson Demitz wears The Beverly Hills Hotel's five-year gold pin, from work 1976–1984 as Front Desk Manager and Duty Manager there, and a small decoration awarded in 1993 for various deeds in his Dalecarlian motherland by Sveriges hembygdsförbund (sv). The latter is the Association of Swedish Homelands and has over 1,900 homeland societies from all parts of that country as member organizations. What's the good word on Jacob Truedson Demitz?